The armor of Rome felt a strong influence from its neighbors. Early Roman armies displayed helmets similar to those of Greece and Gaul. 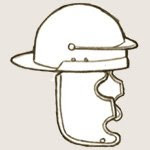 After Caesar conquered Gaul in the 50s BC, the Roman government employed the very skilled iron smiths of that country to produce the legions' first iron helmets. Consequently, Gallic style became prominant in this Roman equipment. In the later Empire armor was influenced by the Persians and Sarmatians. I illustrate a few of Robinson’s types bellow. 4th century BC to the 50s AD. 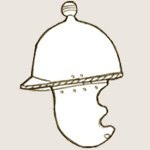 The Romans copied this style of helmet from the Gauls and Celt-Iberians. The legions of Julius Caesar’s time would have worn helmets like this. There is an attachment at the top for a horsehair or feather plume. It is named for the find site, the Necropolis at Montefortino, in northern Italy. Typically bronze, the helmets of centurions were often plated in tin. Late Augustan to Tiberian period. This type of helmet was very well made. The horizontal ridge along the brow was put in place to prevent sword blows from hitting the main headpiece. It is named afrer the Coolus region of the Marne River valley in present-day France where the first examples were found. Late Augustan to Tiberian period. 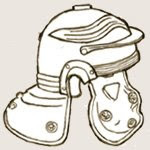 Unlike the Coolus C, this helmet was mounted with side tubes for plumes and a top spike for holding a horse hair crest. This crest would be held in a small metal box, rather than the Republican era method of gathering all the hair at one point like a paintbrush. As more advanced forms of helmet were developed the Coolus was continued to be used by auxiliaries. 1st century AD. 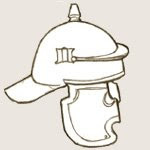 The embossed eyebrow pattern at the front of the shull cap displays a Gallic influence, resulting in the name of this family of helmets. The drawing shows a Gallic H, which featured a more sloping neck gaurd then found in previous Gallic types. 3rd century AD. The term "Italic" applies to a whole family of Roman helmets all sharing a similar style. They were used at the same time as the Gallic types. A notable difference is the fact that the Gallic embossed eyebrows are missing. 3rd century AD. 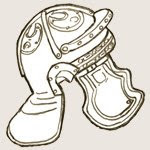 (this term, Spangenhelm, is best applied to helmets from the Middle Ages.) Believed to have originally been developed by the Sarmatians, this helmet was relatively easy to produce. It was made of between four and six curved iron plates shaped into a bowl and riveted together by bands or Spangen. Adopted by the Romans in the 3rd century AD, it continued to be used by European armies well into the 7th century. 4th century AD. 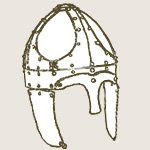 This helmet appeared with the end of the production of the Gallic style helmets. It consisted of two curved plates connected by a central ridge. To this cheek pieces, neck guard, and sometimes nose piece were added. Produced in a variety of styles, they were manufactured in huge quantities for infantry and cavalry. By this time the Empire found it more cost effective to reduce the armor of the legions. A helmet and a shield would, on most ocassions, be the only armor a Roman soldier would receive. The style may be from a Persian influence. Hello, my name is Brian Mark, I am 16, and I am an amateur Roman Historian. I would just like to say that your site(s) have been very helpful and interesting. Continue the great work! 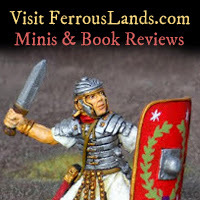 PS-If anyone knows Johnny Shumate here, can you ask him if it is ok if I use his art prints in my blog, The Late Roman Army (3rd-5th Century AD)? P.S. I like the 3rd - 5th cen. focus of your site. There's as much info on that period, so it's nice to know someone is researching and presenting on that topic! Very informative! Do you happen to have any information on the soldier's peripheral vision when he would wear any of these helmets? Also, when helmets were damaged (and the armor in general), did they usually remake them (using the old one) or just make a brand new one? I am writing a paper for a roman art history class on the battle sarcophagus from Portonaccio. The faceless general on the relief work on the front is wearing a helmet and was wondering if anyone could direct me to where i might find info on that particular type of general-in-the-field helmet. 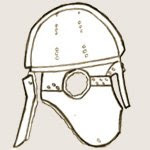 RomanArmy.comhas an article about Robinson's helmet typology. Robinson wrote a book all about Roman helmets. It's the standard for helmet classification, but it's long out of print. The article breaks down the book and explains the typology.